“Comics aren’t real books” is a thing that people say sometimes. In one particular case, I’m inclined to agree. When it comes to mystery stories, I like graphic novels waaaaaaaaaay better. 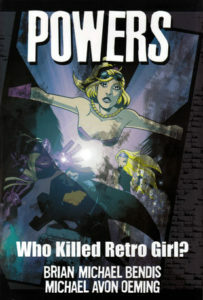 For example take the introductory arc of the Eisner award-winning Powers, a gritty detective drama about the murder of the seemingly invulnerable Retro Girl. Unlike a classic novel, the crime scene, the evidence, and the interviews with suspects can be carefully crafted in 1000 ways that reward an eagle-eyed reader. Unlike a movie, we can take as much time as we please in absorbing the details before moving on with the story. We are rewarded for paying attention in a few ways during the story, and the dopamine hit for recognizing the importance of a clue a few panels before it becomes explicit is a unique kind of fun! As the mystery unfolds, Detective Christian Walker introduces the rookie Deena Pilgrim to the terrifying world of caped heroes that exists alongside our own. The conceit is brilliant in that it adds whole dimensions of possibility that would be inaccessible to a more grounded setting. Walker’s familiarity with these larger than life personalities arouses Pilgrim’s suspicions, and a second mystery ignites. That being said, I was less than happy with some of the components here. Powers falls victim to some of the tropes that most television dramas embrace (or so it appears, for now). The mystery resolves itself in what I would describe as a ham-handed way. I suppose my slight dissatisfaction at the resolution makes sense in the gritty world that Bendis has built here. Powers takes every opportunity to show us that this is NOT the glamorous golden age of superheroes. The threads that are left hanging for future issues will keep me coming back, at least for the moment. Now, since I’m 18 years late to the Powers party, nobody spoil me!